And thus, perceptive audiences might pick up the clue that as with many of the famed Danish author’s fairy tales such as “The Little Mermaid,” life will not be very smooth for the lead character but the ending can offset what appears to be devastating consequences. Artistic-Associate-Anthony Irons,, Christopher Donahue and John Gregorio. 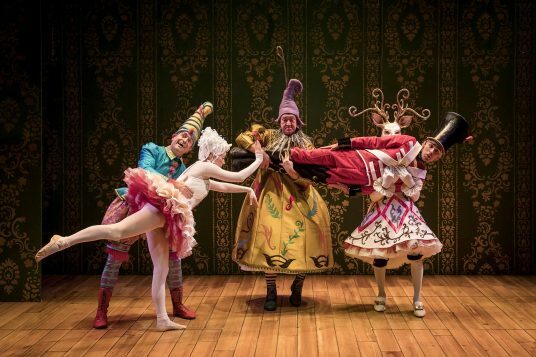 Adults will appreciate director Mary Zimmerman’s beautifully presented adaptation of the fairy tale as an old-fashioned, 19th century pantomime. Preteens and teenagers will understand the words the actors sing at the conclusion are meant to make them feel better about the story and hopefully, will help them through tough growing up years. 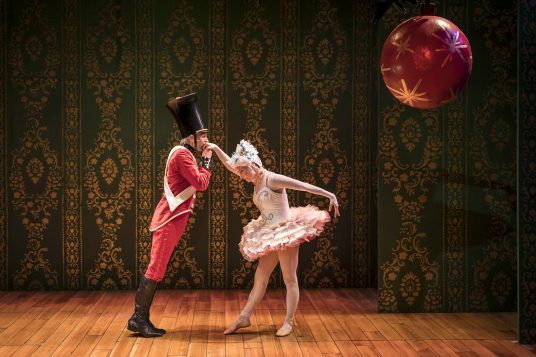 Because at the end of what is a disturbing story for the tin soldier and his love, a toy ballerina, the actors sing that people can get thru the bad things if they are resilient because bad times will pass. However, as good as the play is, and Zimmerman’s production is truly a work of art, the show probably would not be ideal for youngsters below fifth grade. That said, it’s on to the story. It opens with a very young child receiving some tin soldiers. 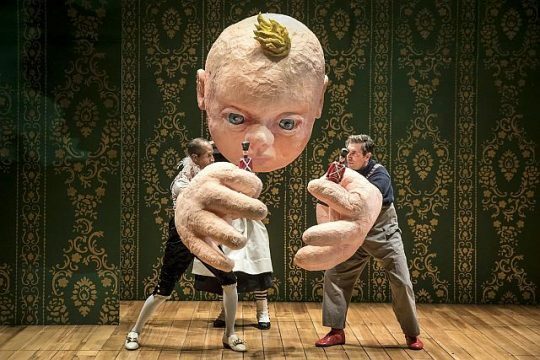 The child, presented at first as more than life sized with a huge puppet head and large puppet hands, keeps two of the soldiers and tosses one aside that has only one leg. The soldier (Alex Stein) who jumps to move, has a balance problem, has “missing” scrolled down a black pant leg, sees a ballerina (KaseyFoster) in a doll house. The two come to life to help each other as they fall in love but fate intervenes. The tin soldier is tossed …(spoil alert) and the Jack in the Box who is jealous of the soldier tosses the ballerina,,, (spoil alert). 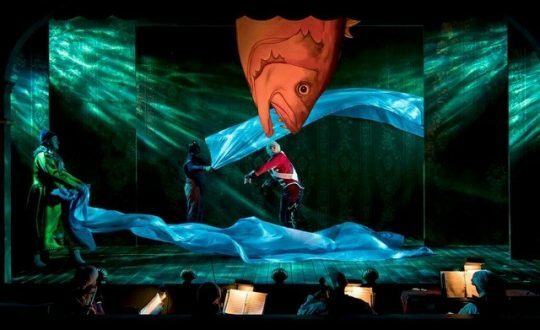 Among the tin soldier’s travails is to be eaten by a fish but the fish brings him home in The Steadfast Tin Soldier at Lookingglass Theatre. Between the opening gift of the soldiers and the cruel ending, the one-legged tin soldier goes out a window probably arranged by a goblin (Anthony Irons), ends up swept away in the gutter where he encounters a rat (John Gregonio) is carried into a canal in a paper sail boat where he is eaten by a large fish that is caught then sold to the household’s nursemaid, (Christoper Donahue) and ends up back in the child’s household. 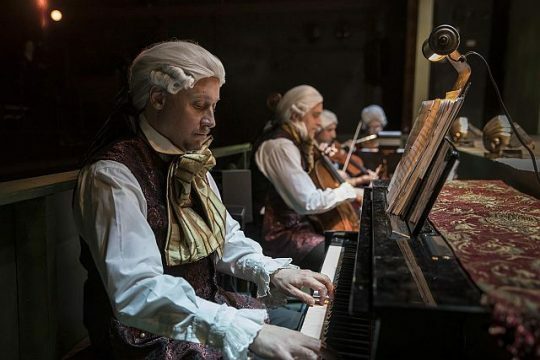 Backing up the pantomime, are 19th century costumed conductor/pianist Leandro Lopez Varady, cellist Michael Palzewicz ,violinist Greg Hirte and flutist Constance Volk. Leandro Lopez,Varady, piano, Michal Palzewicz, cello, Greg Hirte, violin and Constance Volk, flute. Scenic designer Todd Rosenthal’s gorgeous, old-style panto-theater set frames the action and Zimmerman’s unerring direction makes the transitions from human to toy scale believable and easy to follow. Kudos also go to Chicago Puppet Studio. This production may be designed for the holidays but it really is a play to marvel at and appreciate any time of year. DETAILS: “The Steadfast Soldier” is at Lookingglass Theatre in the Chicago Water Works, 821 N. Michigan Ave., Chicago through Jan. 13, 2019. Running time: slightly over 1 hour with no intermission. For tickets and other information call (312) 337-0664 or visit Lookingglass Theatre.